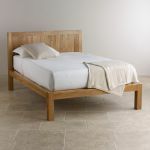 The Alto Solid Natural Oak Double Bed will make an excellent addition to any bedroom, complementing both traditional and contemporary rooms alike with its classic design. 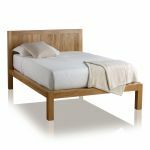 Made from high quality natural solid oak, it's characterised by distinctive box finger joints with a subtly inset panelled headboard. It displays a simple elegance, where the exquisite grain patterns of the oak and golden colours can take centre stage. 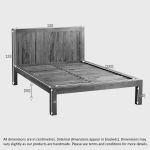 To protect and enhance these natural qualities, the bed is finished with a fine coating of specially-formulated clear wax polish. 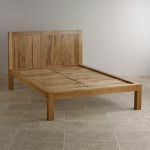 If you choose to invest in this beautiful double bed, we highly recommend taking a look at our exclusive quality mattresses too. Designed to offer the ultimate in comfort and support, each mattress promises a restful and rejuvenating night's sleep.